We had a dilemma on our hands. 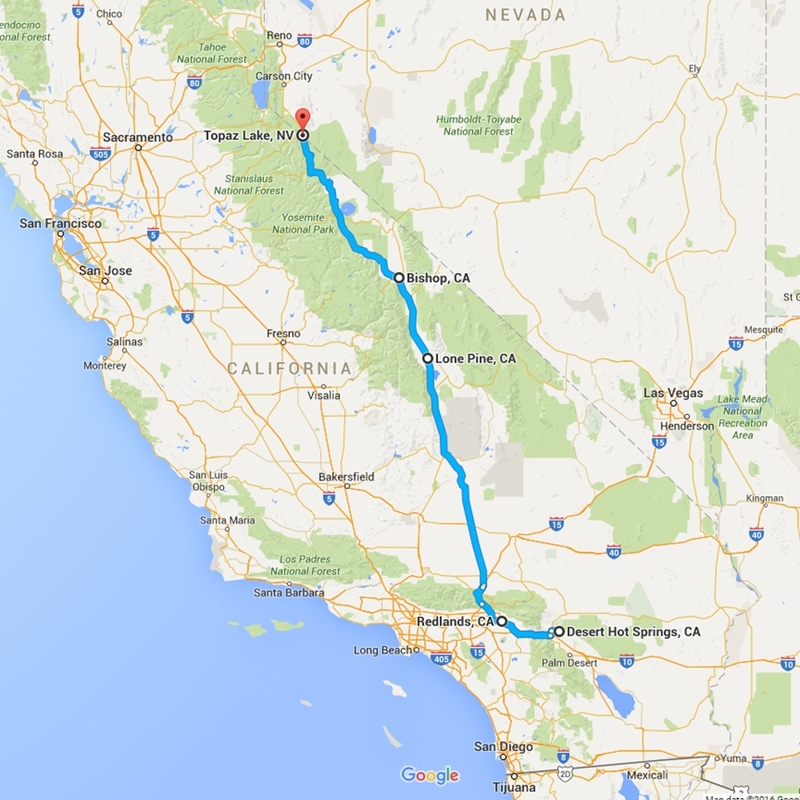 We were currently in Desert Hot Springs, California, and we knew that we wanted to head to the Oregon coast. Our first inclination was to check out places like Santa Barbara, Monterey, San Francisco and Napa along the way. And then we looked at the cost of camping in these areas. It's possible there are some affordable options we didn't know about. But after having just dropped some serious cash on a new solar system and stabilization upgrades, the California coast looked like it was trying to break the bank. So we turned to an alternate north-bound path: Route 395. I had checked the annual average temperatures to make sure we weren't likely to be confronted with freezing temperatures at night. And, for the most part, this wasn't an issue. But what I didn't take into account is that most of the attractions off Route 395 are at higher elevations than the towns themselves. As a result, many of them are not open until April at the earliest, and sometimes even as late as June. Taking this route in the spring meant we missed out on some really cool stuff. Oh well, just more reason to return! 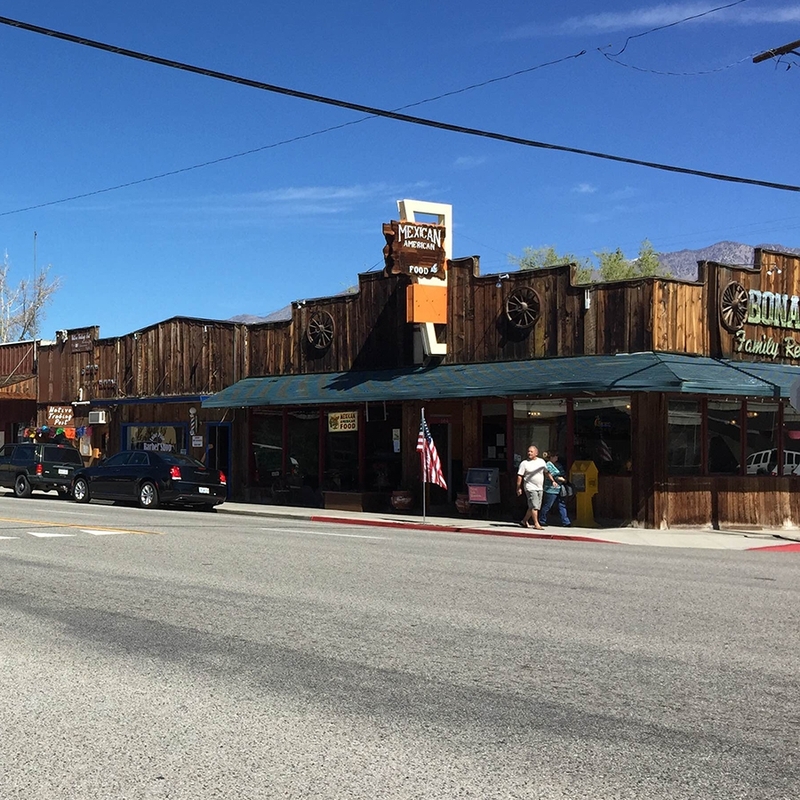 Our first stop was in Lone Pine, a charming town of 2,000 people. With a distinctly Wild West feel, it has been the filming location for hundreds of movies and TV episodes. And it's not hard to see why. The Eastern Sierras paint a dramatic backdrop, while the strange rock formations at Alabama Hills provide an otherworldly feel. We camped at Tuttle Creek Campground, a BLM campground with a dump station and chemical toilets. It is $5/night, or $2.50/night for those with an Interagency Pass. The pleasantly babbling Tuttle Creek ran directly behind our RV, and we could see numerous mountains right out our window. This campground is among our favorites we've ever stayed at, even with the monster speed bumps on the way in. 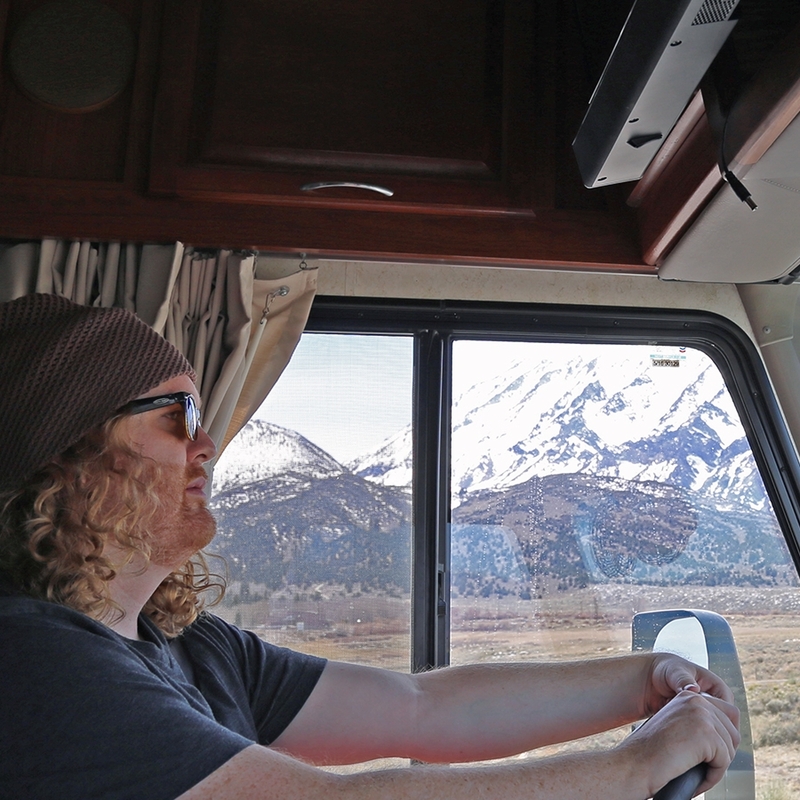 Just down the road is Alabama Hills, which offers free boondocking. The caveat is that cell service there is spotty to nonexistent. From our perch at Tuttle Creek above Lone Pine, we got great views and great Verizon and AT&T. 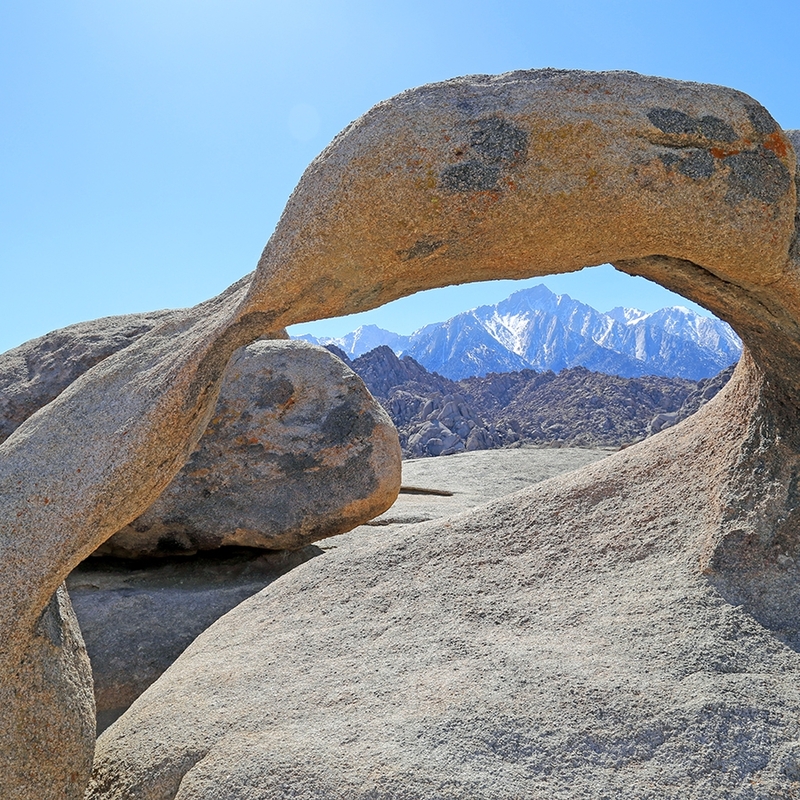 Plus, we were still in close range of all that Alabama Hills had to offer, like the Mobius Arch Loop Trail, which leads to this delicately-twisted natural arch that perfectly frames Lone Pine Peak. The trail is 0.5 miles and is rated easy. There are two roads that lead to Tuttle Creek. The most straightforward is off of Whitney Portal Road. A bridge over the Los Angeles Aqueduct tightens the road to one lane, and construction on this bridge during our stay made us seek another entrance. The second option is Lubken Canyon Road, which also narrows to one lane for half a mile or so. Fortunately, there are some pull-outs, and this route is generally less winding. Hard to say which is better — just be prepared for a squeeze, either way. Every time we headed into town for groceries along Whitney Portal Road, we passed a strange sight. 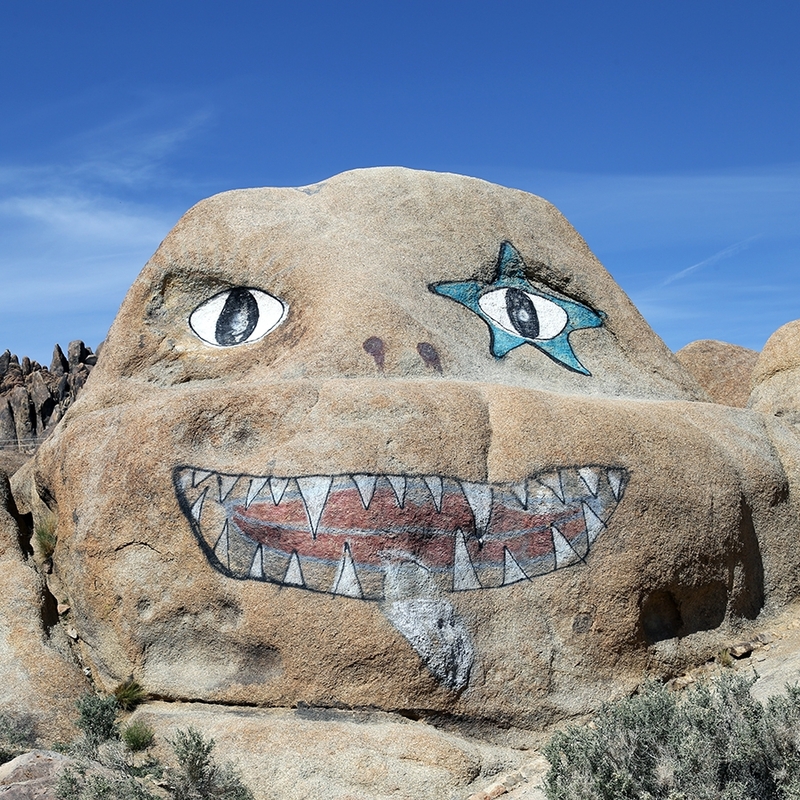 This formation, which I've seen called everything from the "Nightmare Rock" to "Brenda," has inspired locals to paint it with a face. Nope; no idea what it's all about. Speaking of groceries, that was our only quibble with Lone Pine. There is one grocery store, and it's not particularly well-stocked. Plus, you have to really double-check the dates on your produce. If you're visiting the area, you might want to stock up before arriving. 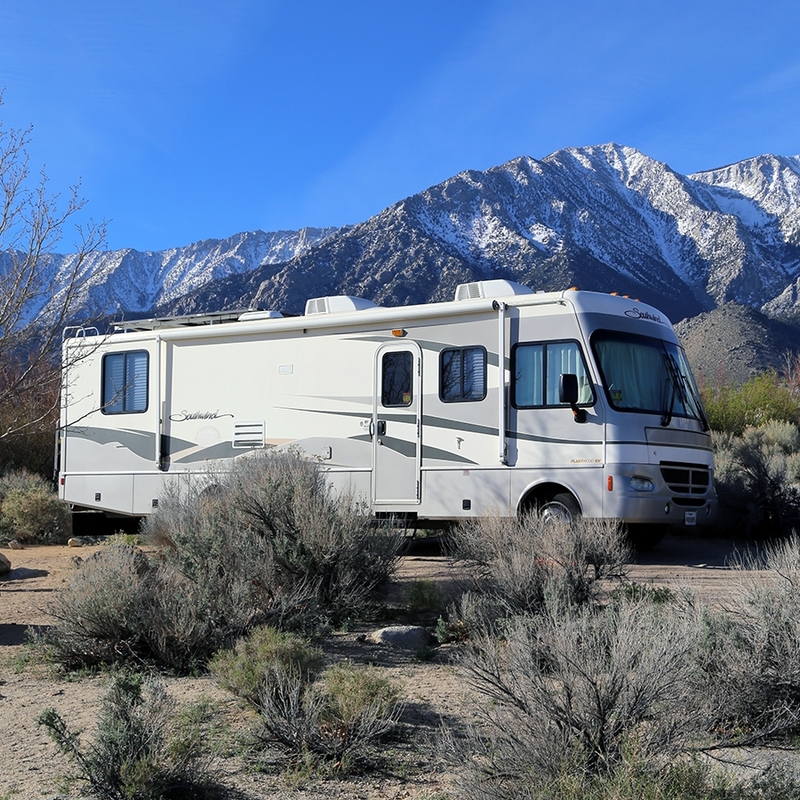 The final reason we chose to stay in Lone Pine was that it was a perfect launch point for Death Valley National Park, but that deserves its own post (which you can view here). After ten days, we headed just 65 miles up the road to Bishop, a town of 3,900 that feels much bigger than it is. We first tried to boondock on some BLM land down Silver Canyon Road, but found that there were few campsites, and all of them were incredibly dusty. Then we tried our hand at Pleasant Valley Campground, which definitely lives up to its name but has zero cell reception. 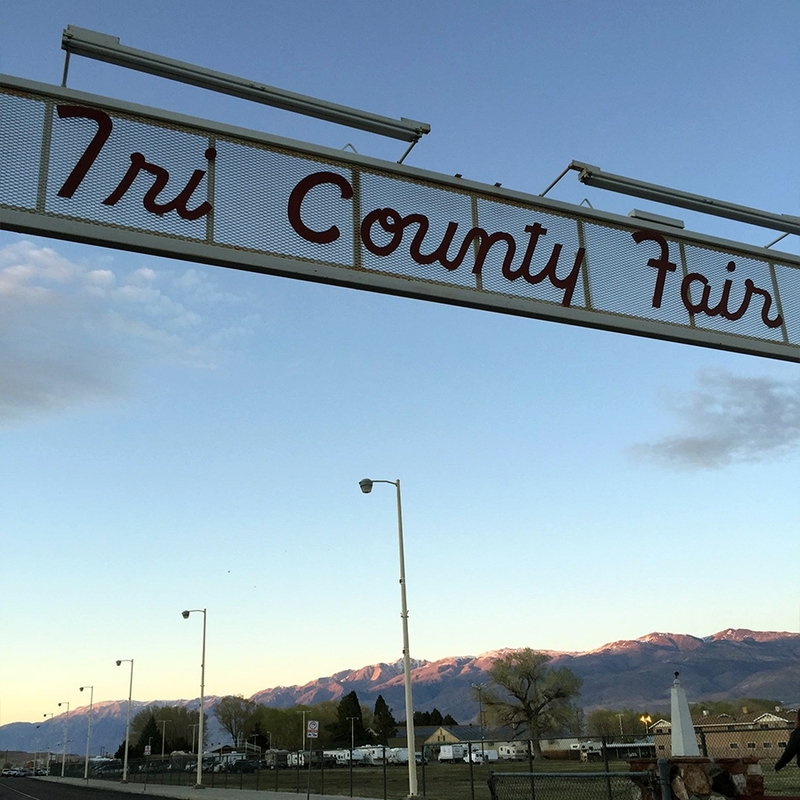 Finally, we landed at the Tri County Fairgrounds, which is not scenic, but is right in the middle of town and offers a decent discount on weekly stays. Following the suggestion of Tales from the Mutiny, we dined at the quirky local burger joint, the Bishop Burger Barn. We advise you go on a good-weather day, as there is limited covered seating. 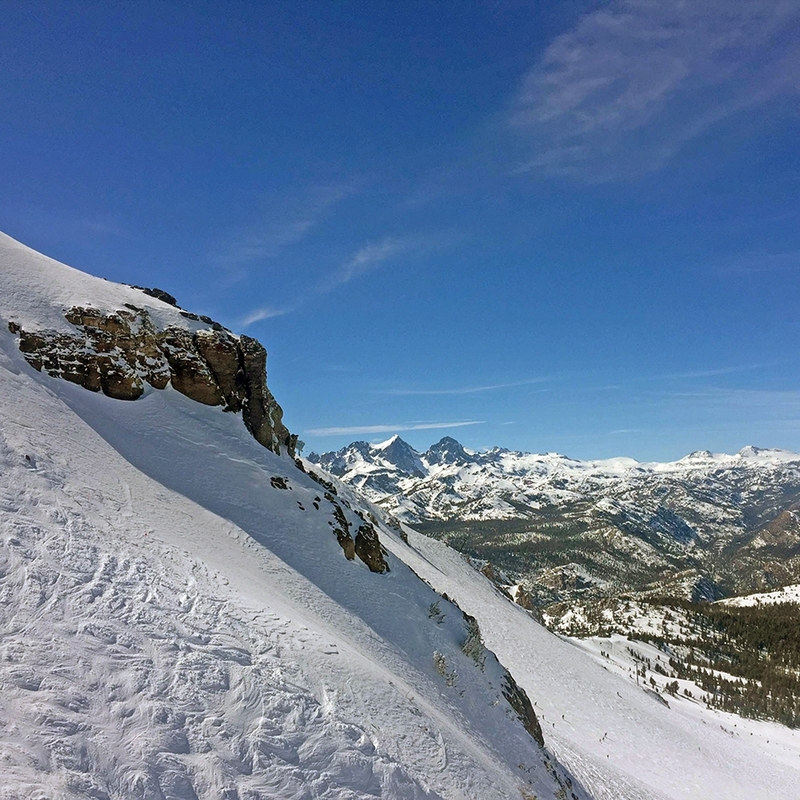 From Bishop, we took a day trip to Mammoth Lakes, a ski resort town 40 miles up Route 395. 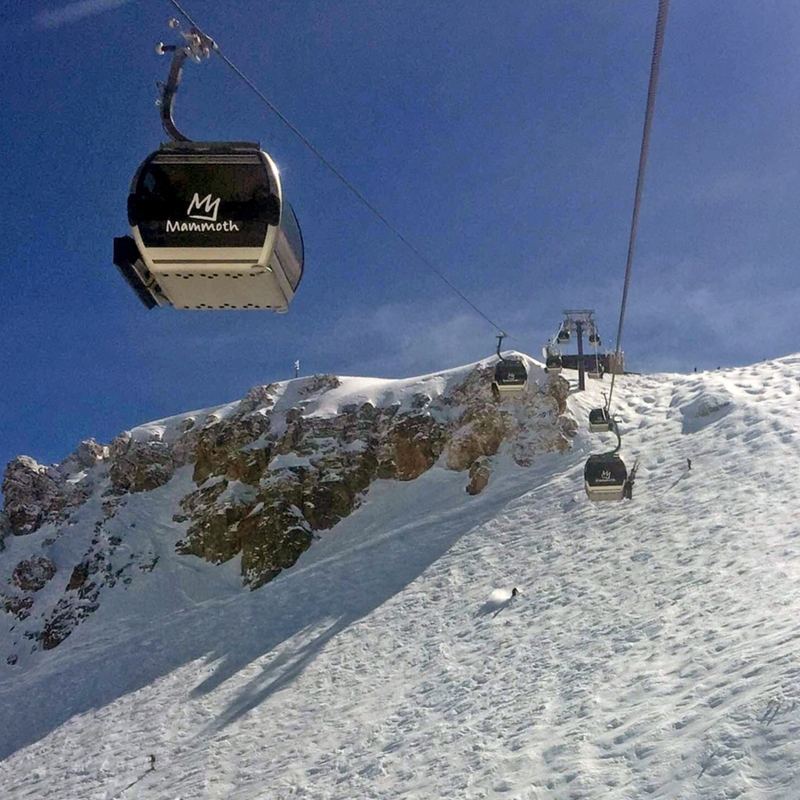 With just a couple of hours on our hands, I decided to book us a "scenic gondola" (read: enclosed ski lift) ride to the the peak of Mammoth Mountain. 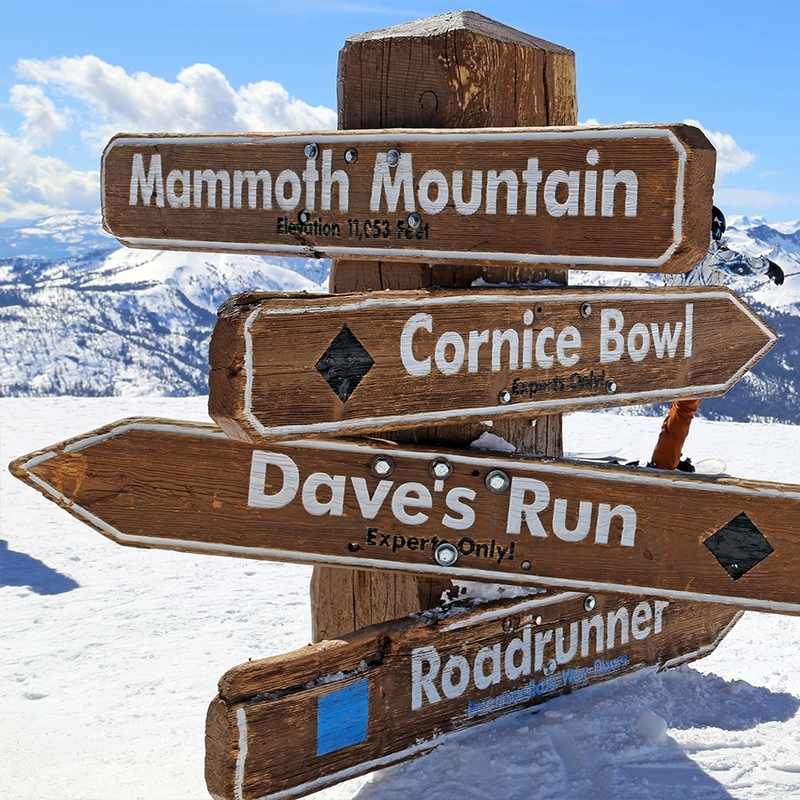 At a cost of $25/person, you can take an aerial trip up to 11,053 feet that takes 7 minutes each way. 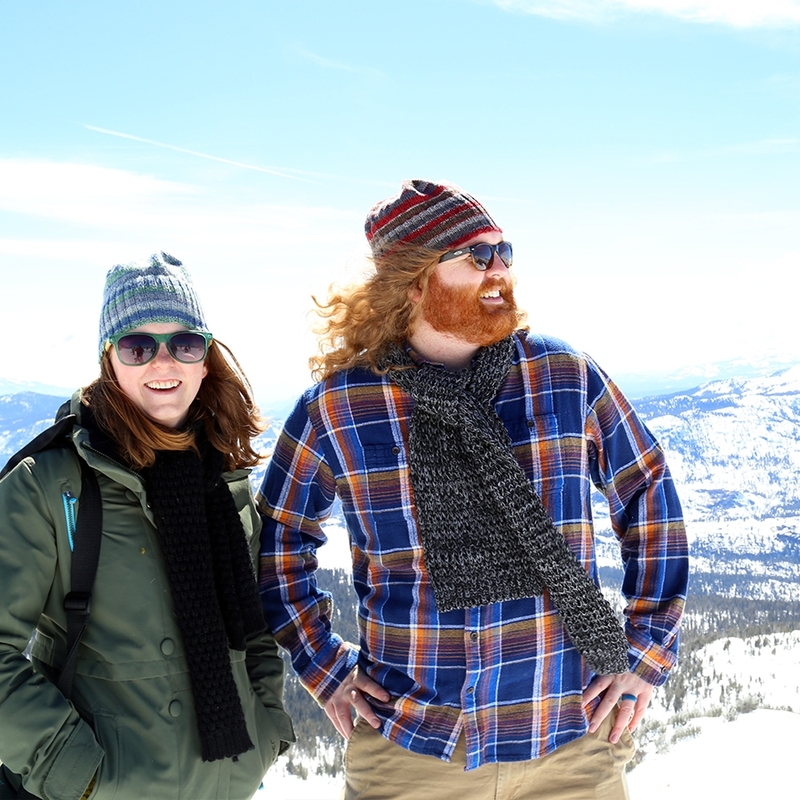 The time seems to fly by (forgive the pun), as there is plenty to look at during the ride, from snowboarders doing tricks to skiiers navigating the steep slopes. When you step off the lift, you'll be surrounded by skiiers getting snacks and preparing to head back down the mountain. The interpretive center teaches about the wildlife supported by the mountains, highlights different peaks, and discusses the historic importance of the area. 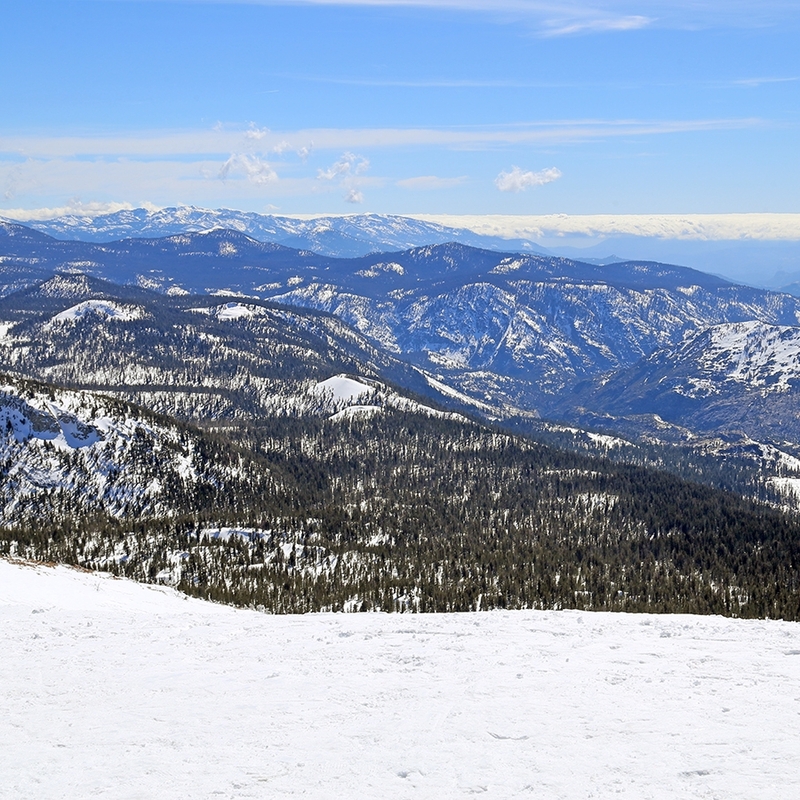 You can even see part of Yosemite National Park from here. On our way back, we followed the recommendation of Tales from the Mutiny again, seeking out Crowley Hot Springs, also called Wild Willy's Hot Springs. The instructions Lynn gave us for getting there went something like this: Turn at the green church, and go over three cattle guards. After the third cattle guard, take an immediate right onto a dirt road and follow it to the end. And she was right. The parking lot is at 37.659069, -118.770995, but keep an eye on the GPS, as some guidance programs will take you somewhat off course. Also, bear in mind the dirt road doesn't require high clearance, but it is bumpy. When you park, you'll head down a walking trail past a pond (or a dried bed, if it hasn't rained in a while). 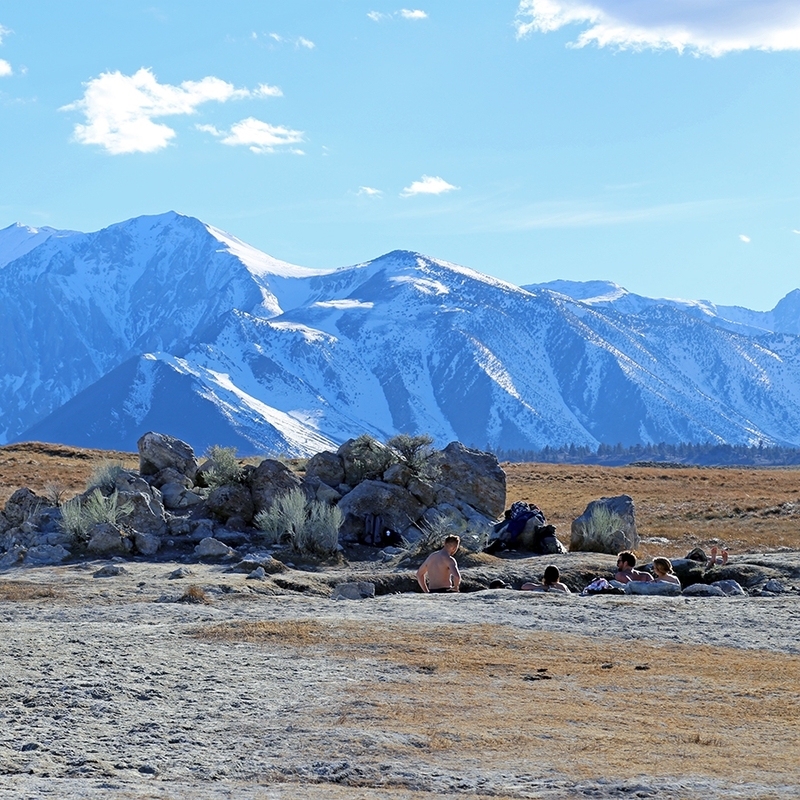 Within a quarter of a mile or so, you'll arrive at the hot springs. There are two pools, the smaller of which is warmer. You may run into crowds, as we did (we went on a Thursday afternoon). Wear your bathing suit there or change in your vehicle, but you won't find a bath house when you park. Bring a warm towel for when you're ready to walk back to the car, and a change of clothes so you can dry off. The closest bathroom may very well be the McDonalds in Bishop, 18 minutes away, so plan accordingly. I'd always heard of Mono Lake, but I didn't know anything about it beyond "it has weird formations," so I thought it deserved a pit stop. I was right. 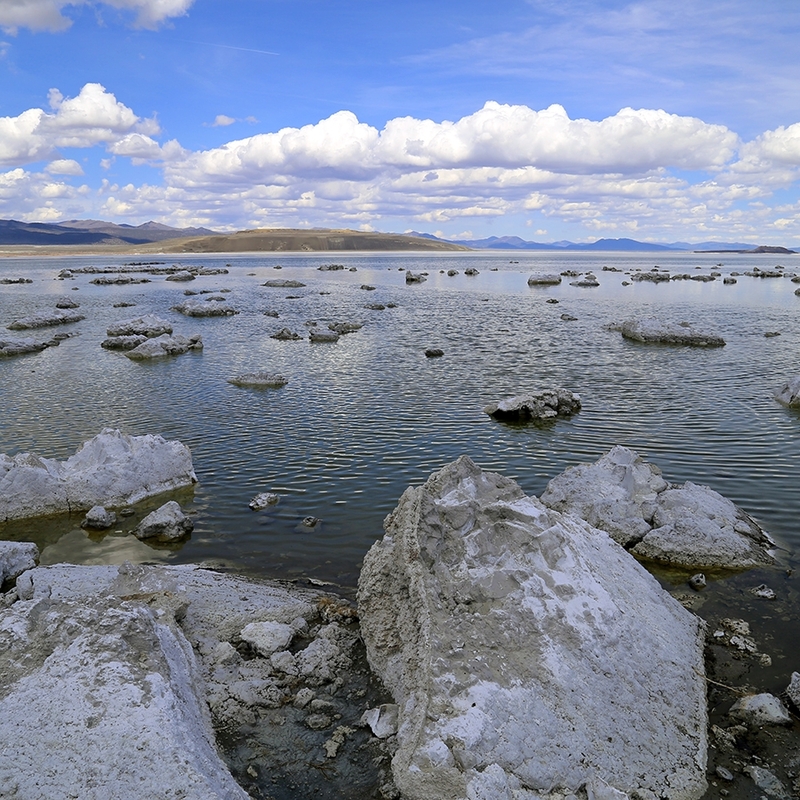 Because Mono Lake has no outlets, the water has an extremely high salinity which supports very little but brine shrimp and the black flies and birds that feed off them. The odor is sulfuric, and the ground is mushy. But by hopping from limestone formation to formation, you can get a great view of this strange body of water. 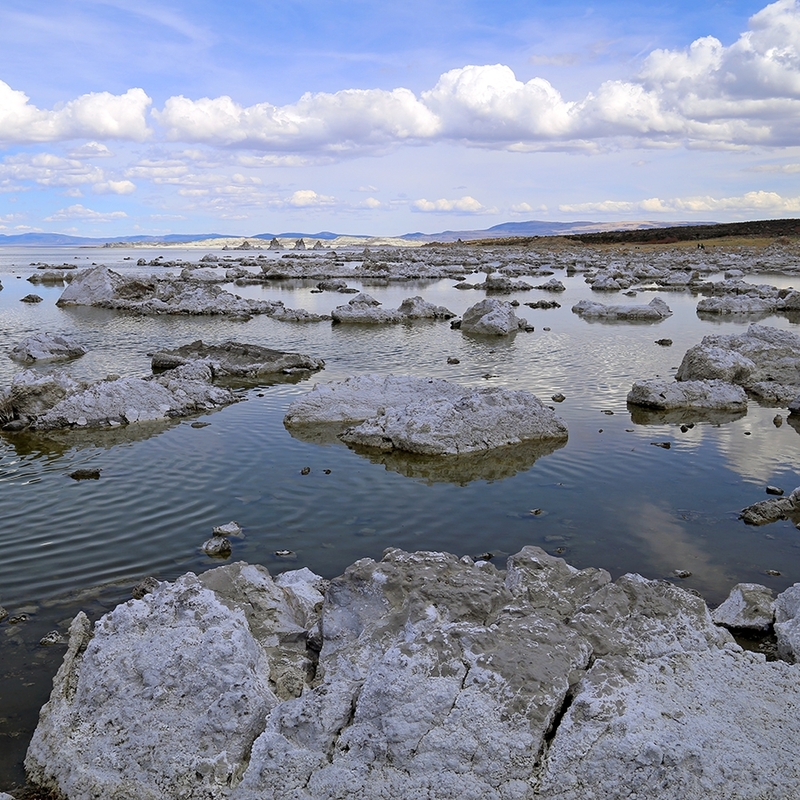 From Mono Lake, we continued along the highway for 135 more miles. 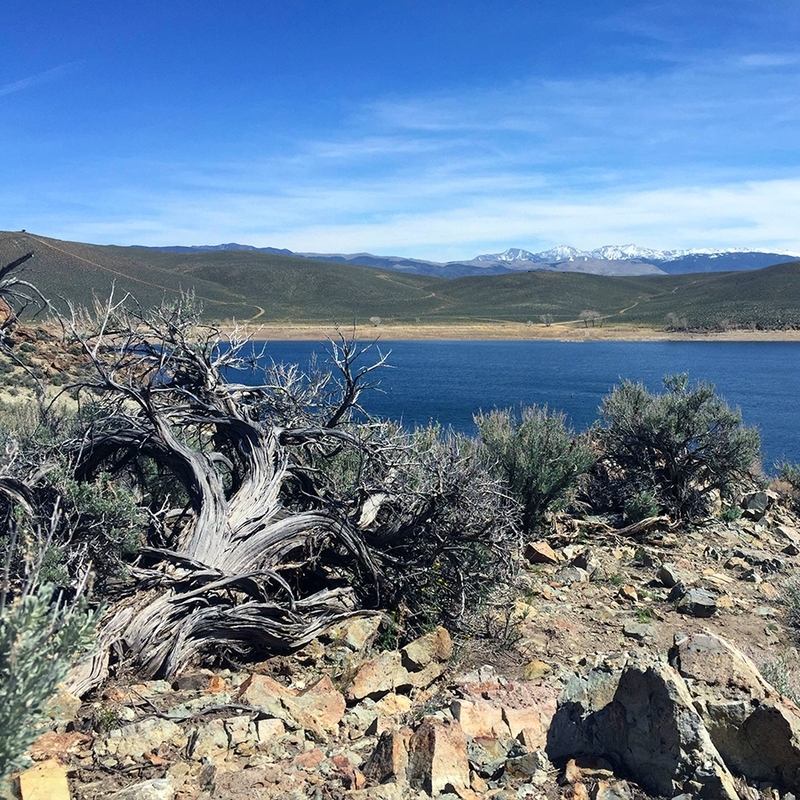 We crossed the border into Nevada and turned right on the very steep Topaz Lake Park Road. 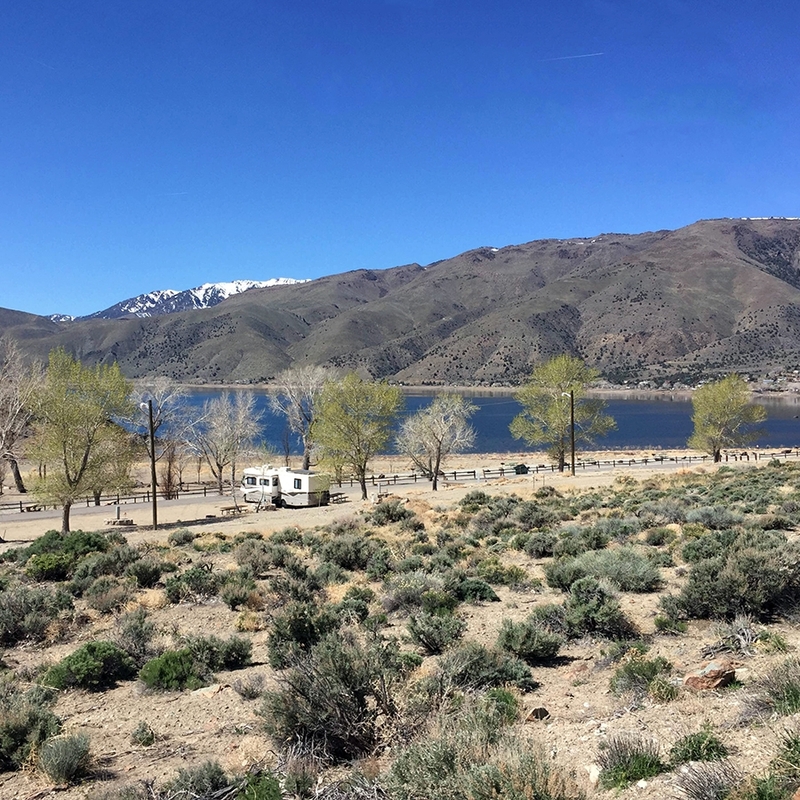 Following this for a few miles, we arrived at our last stop on our Route 395 journey: Topaz Lake Park. 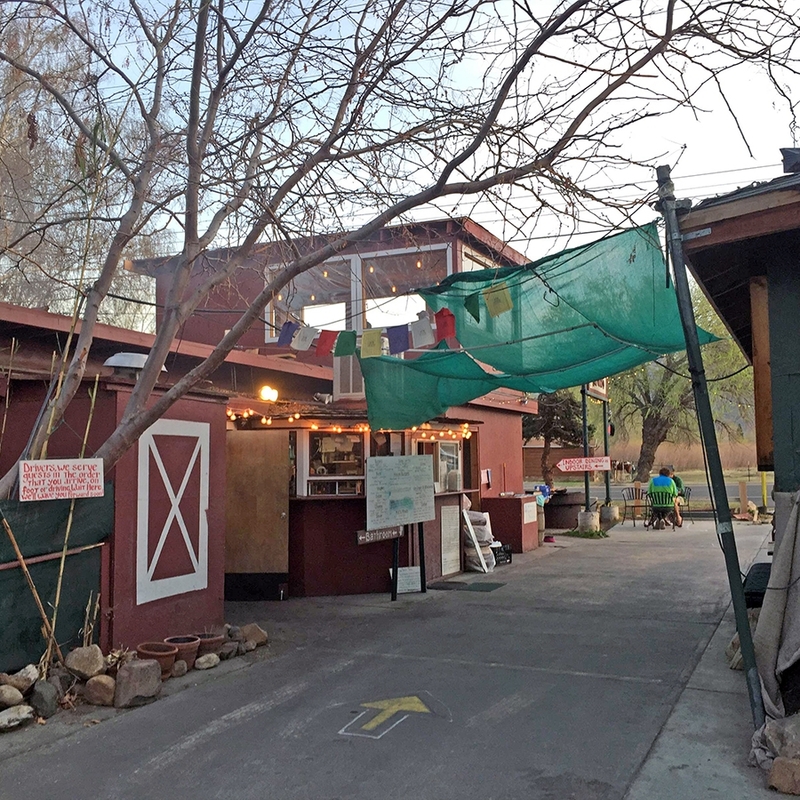 The park offers water and electricity ($35/night), dry camping ($25/night) and a dump station. There are also bathrooms with running water and chemical toilets. Watch out, though; at least when we were there, the showers only had cold water. For most of our stay, we had the place nearly to ourselves. 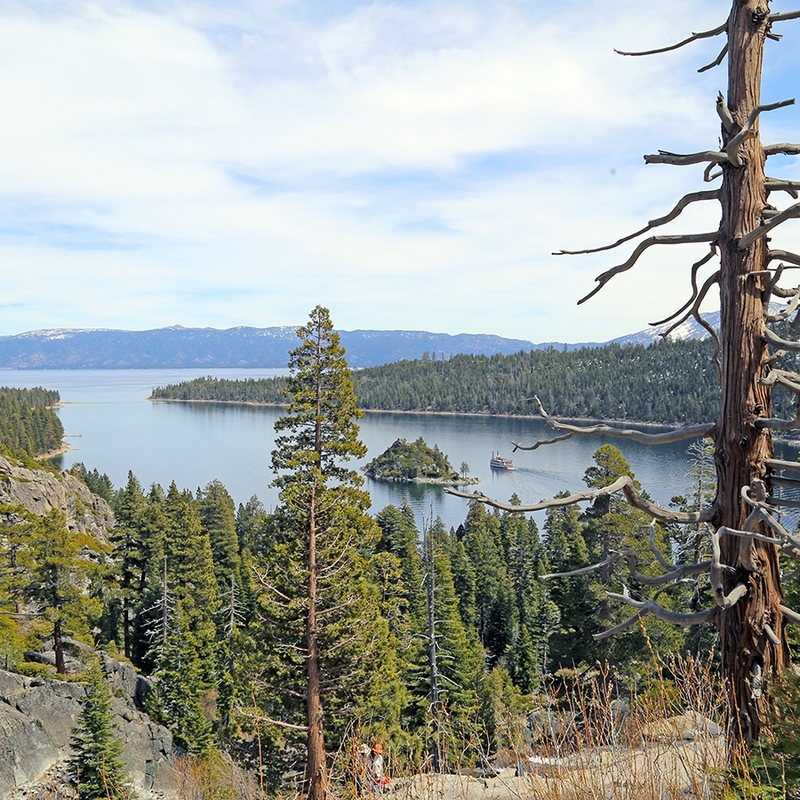 The park offers a boat ramp and pier, as well as a short hiking trail up a rock outcropping. The view from the top is worth the effort. 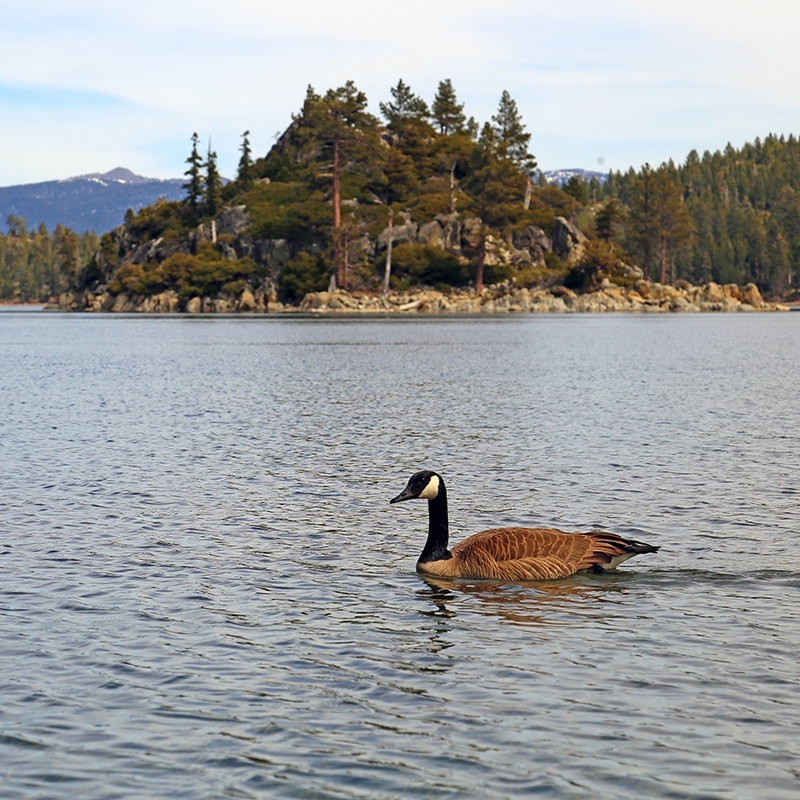 From Topaz Lake, we took a day trip to South Lake Tahoe. I had been warned by my parents, who vacationed there last summer, that the lake is huge, so I knew to avoid biting off more than we could chew. 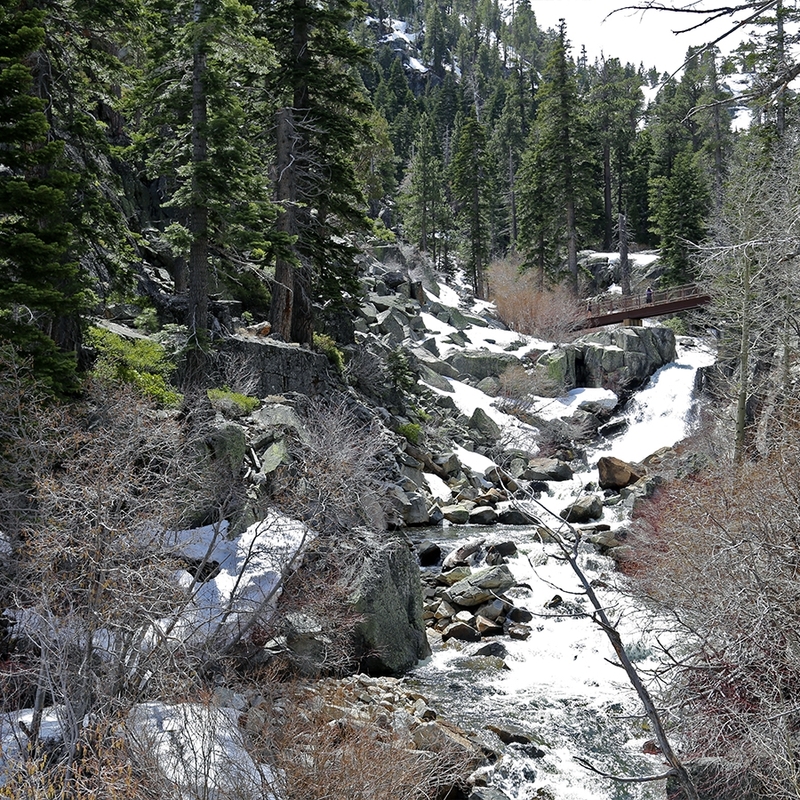 Our first stop was Eagle Falls, which was still surrounded by snow. We only hiked a small portion of this trail to make the most of our time. 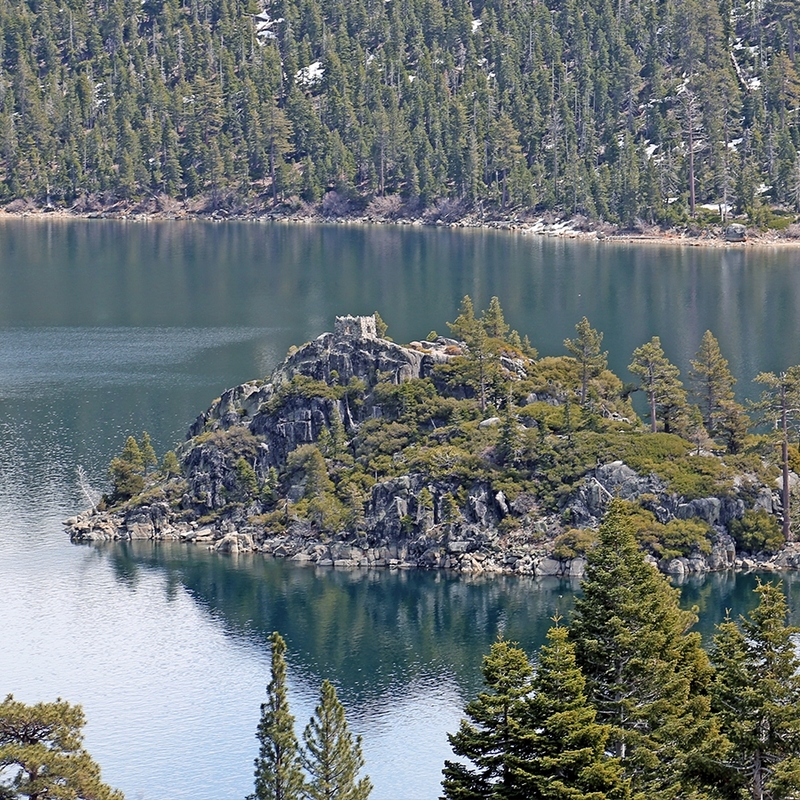 From there, we went less than a mile down the road to the Vikingsholm Trailhead. Vikingsholm is a castle (!!!) 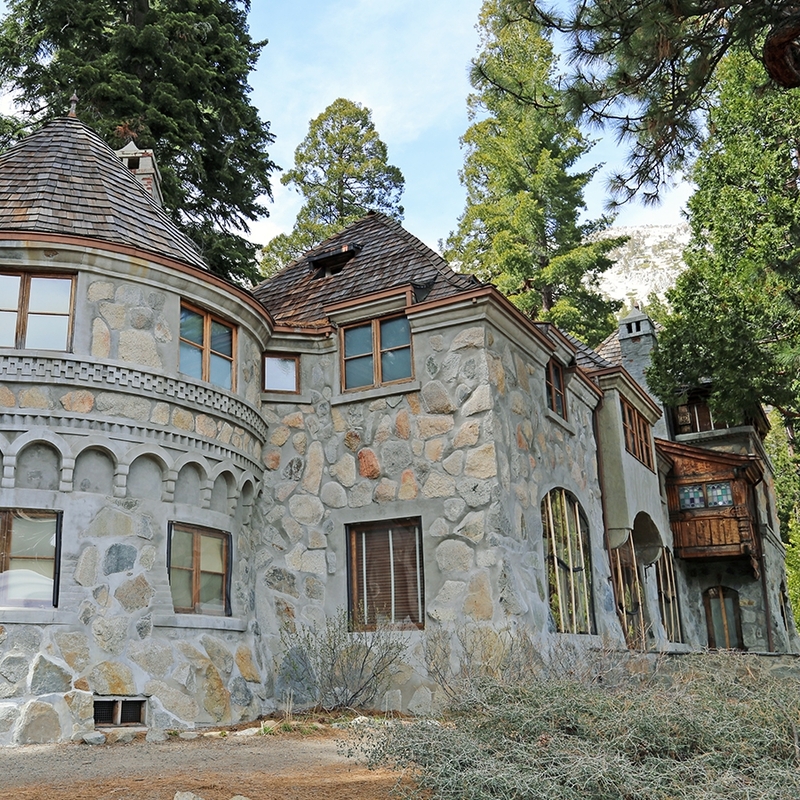 that was built in 1929 and is considered "one of the finest examples of Scandinavian architecture in the United States." For anyone who has played the video game Skyrim (we named our truck "Dovahkiin" after the main character of this game), you'll understand why we felt like we had been transported to another world. Where's my tankard of mead? If there's any house that might entice us to settle down from our life on the road, it's this one. Planting a roof garden before it was hip. The house offers tours during the summer (which we were too early in the season to take advantage of), but visitors are free to walk around the grounds year-round. Unfortunately, we had to earn our way back to the car. The trail to Vikingsholm is one mile straight downhill, so it was a steep climb up to the top. 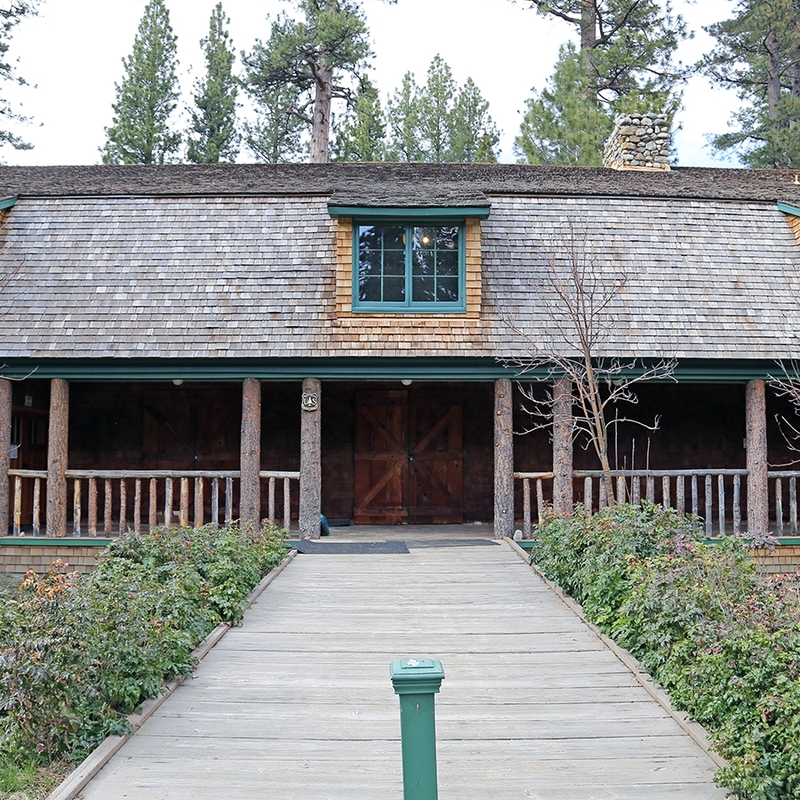 On Fannette Island, the only island in all of Lake Tahoe, there is a tea house that is part of the Vikingsholm estate. As if this place could get any cooler. 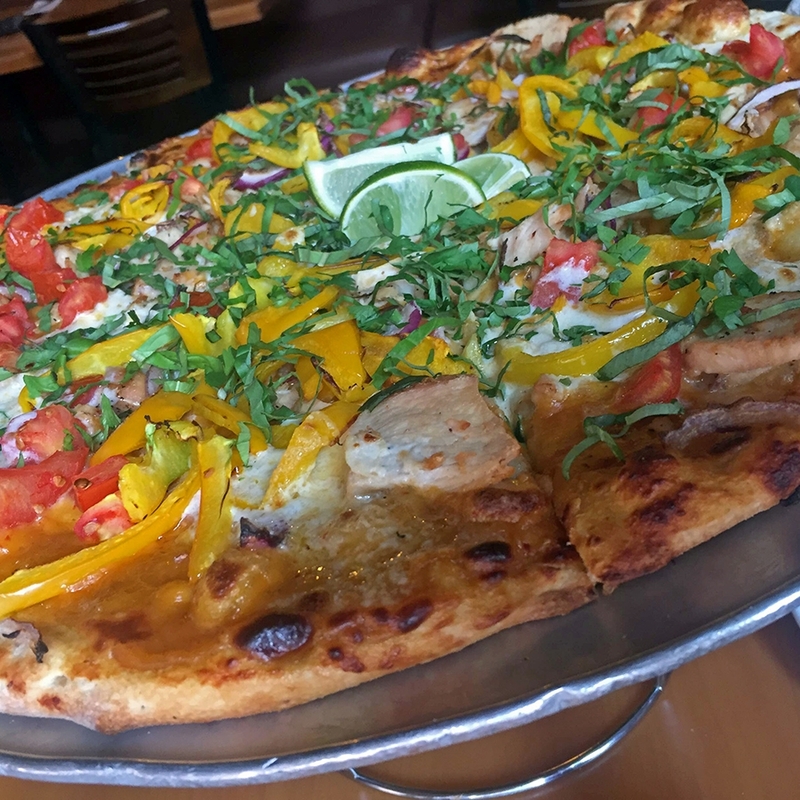 We stopped for lunch at the delicious and highly recommended Base Camp Pizza. 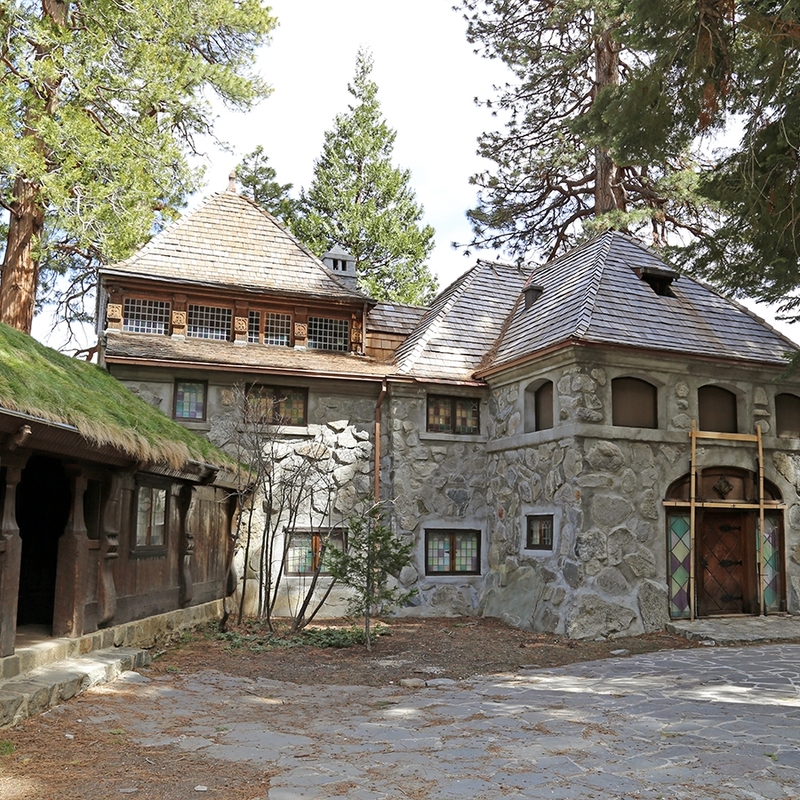 And then we delved back into our Viking-themed day with a final stop at Valhalla, another estate, this one built in 1924. 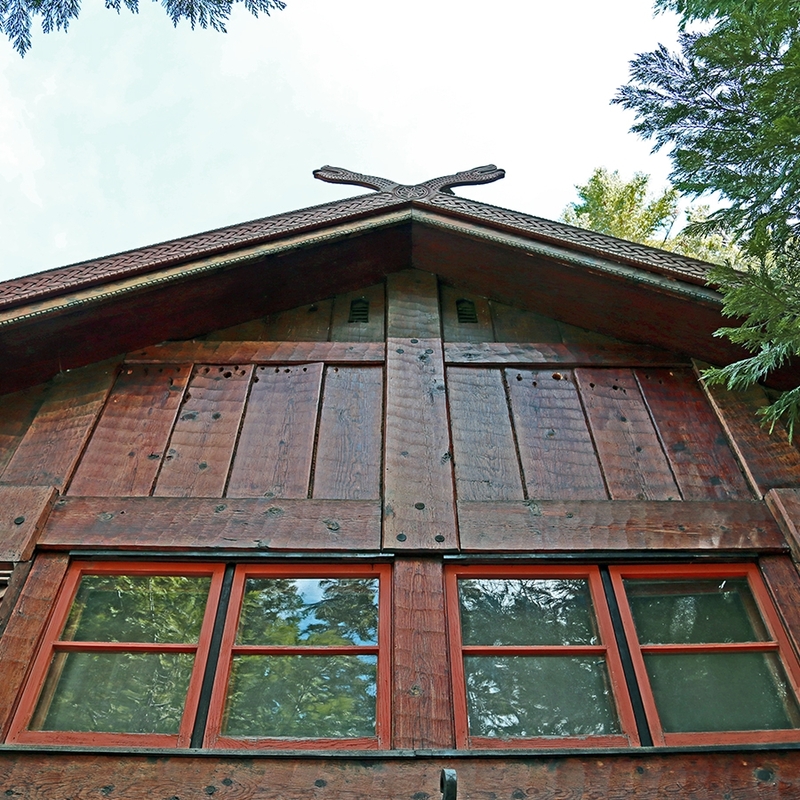 Valhalla is also open for tours in the summer, and it's the site of an epic-sounding Renaissance fair in June. During our visit, we had a quick and pleasant stroll around the grounds; fortunately, there was no sweaty hike required this time. 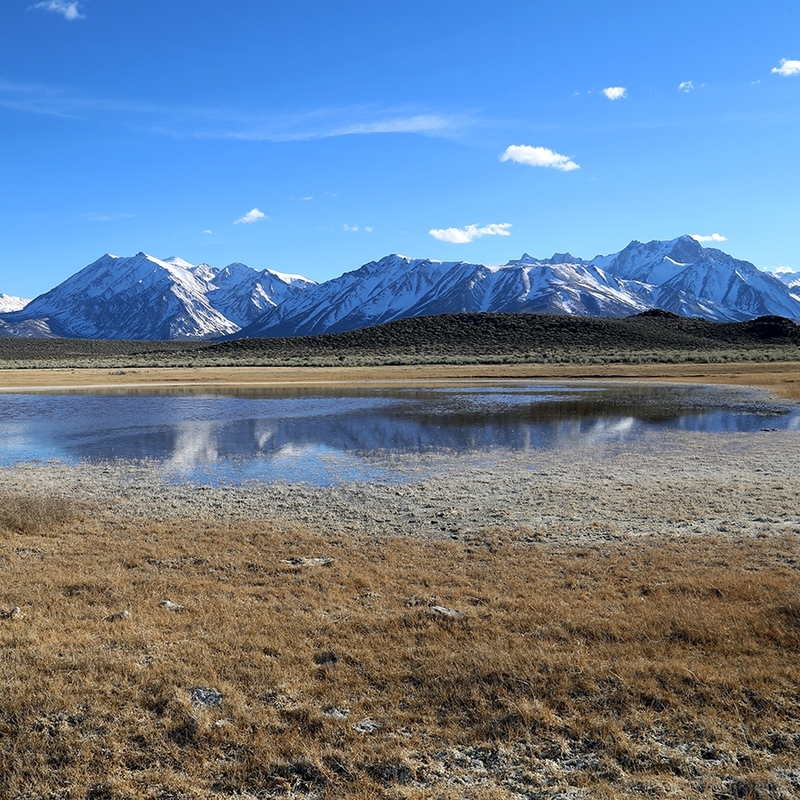 What are your favorite activities and places to stay along Route 395?